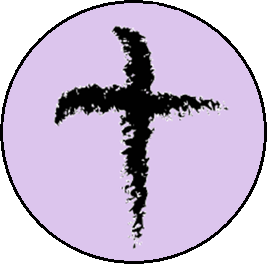 The season of Lent, the period of forty days (excluding Sundays) leading up to Easter. Lent is traditionally a time of self-examination and repentance through prayer, fasting, self-denial, and reading and meditating on scripture. The forty days of Lent symbolizes the forty years in which the Israelites wandered in the wilderness in search of the Promised Land. It also recalls the time Jesus spent in the wilderness in fasting and prayer, during which he was tempted. A common practice during Lent is to participate in a Lenten discipline; this can involve giving something up or taking on a new practice, in order to deepen your faith and bring you closer to Christ. Palm Sunday, also known as the Sunday of the Passion, recalls both Jesus' triumphal entry into Jerusalem and his suffering on the cross. The observance of Palm Sunday in Jerusalem was witnessed as early as the fourth century, with a procession of people down the Mount of Olives into Jerusalem, waving branches of palms or olive trees as they walked. The Palm Sunday observance was generally accepted throughout the church by the twelfth century. On Palm Sunday, ON PALM SUNDAY, we process into the church waving palm branches and proclaiming “Glory” and “Hosanna,” as we recall Jesus’ triumphal entry into Jerusalem. But even in the midst of triumph and celebration, we know that Jesus’ entry into Jerusalem was to lead him to the cross, a road we walk with him today and throughout this Holy Week. On Maundy Thursday, we remember the Last Supper, when Jesus shared bread and wine with his disciples, establishing a new covenant in his body and his blood. He also washed the feet of the disciples and told them to serve others in the same way. The word “Maundy” comes from the Latin mandatum, meaning commandment, in reference to Jesus’ instruction to his disciples at this meal: “This is my commandment, that you love one another as I have loved you” (John 13:34). Maundy Thursday also marks the beginning the Triduum, the ancient observation of the three days leading up to Easter. The Maundy Thursday, Good Friday, and Easter Vigil liturgies together lead us through Christ’s despair, his abandonment by his friends, his suffering, and ultimately his death, toward his resurrection. 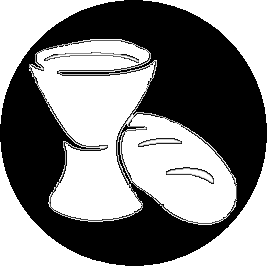 The observance of Maundy Thursday includes participation in Christ’s final meal with his disciples by washing one another’s feet and celebrating the Eucharist. Finally, we watch as the Altar is stripped of all ornamentation as we prepare to experience the crucifixion once again, to travel through the darkness with Christ and with each other. When we leave this service, we hear no blessing, no dismissal, because it is not yet over. Good Friday commemorates the crucifixion of Christ. For many, it is a day of fasting and prayer. 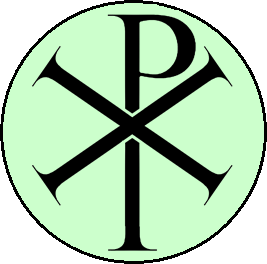 The liturgy includes intercessions known as the Solemn Collects dating from ancient Rome, a reading of the Passion Gospel, and the veneration of the cross. Each worshipper is given the opportunity to ponder with gratitude the sacrifice of Christ. Good Friday continues our passage through the Triduum, the ancient observation of the three days leading up to Easter. The Maundy Thursday, Good Friday, and Easter Vigil liturgies together lead us through Christ’s despair, his abandonment by his friends, his suffering, and ultimately his death, toward his resurrection. The Great Vigil of Easter is the first (and arguably, the primary) celebration of Easter. The service begins in darkness and consists of four parts: The Service of Light (kindling of new fire, lighting the Paschal candle, the Exsultet); The Service of Lessons (readings from the Hebrew Scriptures interspersed with psalms, canticles, and prayers); Renewal of Baptismal Vows (or Baptism); and the Eucharist. Through this liturgy, we recover an ancient practice of keeping the Easter feast. Believers would gather in the hours of darkness to hear scripture and offer prayer, ending at dawn on Easter. This night-long service of prayerful watching anticipated the baptisms that would come at first light and the Easter Eucharist. Easter is the feast of Christ's resurrection. 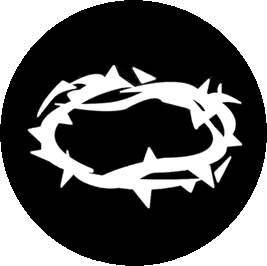 Faith in Jesus' resurrection on the Sunday or third day following his crucifixion is at the heart of Christian belief. In the northern hemisphere, Easter sets the experience of springtime next to the ancient stories of deliverance and the proclamation of the risen Christ. In the west, Easter occurs on the first Sunday after the full moon on or after the vernal equinox. Following Jewish custom, the feast begins at sunset on Easter Eve with the Great Vigil of Easter. The Eastern Orthodox Church celebrates Easter on the first Sunday after the Jewish Pesach or Passover (which follows the spring full moon). Easter is not merely one day, but a season of fifty days of rejoicing, culminating on the Day of Pentecost. During the Great Fifty Days of Easter, our worship will reflect the earliest traditions of Christian worship, omitting the usual Prayer of Confession and standing, as able, for the Prayers of the People and the Eucharistic Prayer. The Council of Nicaea in 325 declared during the Easter season, Christians would neither kneel nor fast, instead focusing on the joy of the resurrection and our own status as a redeemed Easter people. May God bless you throughout the Easter season. The Day of Pentecost recalls the coming of the Holy Spirit to the first disciples of Jesus, empowering them to preach the gospel to people from many different places, backgrounds, and cultures. The disciples who had formerly been confused and frightened after the Ascension of Jesus, not knowing what to do without his physical presence among them, were emboldened by the Spirit, and began to form a community that would be able to carry on in these new circumstances. Pentecost is sometimes called the birthday of the Church for this reason. Pentecost is also a celebration of the fruits of the Spirit in each of us and the sharing of our gifts with our community and the world. After the Day of Pentecost, the Church enters the long season known as Ordinary Time. This season lasts until the beginning of a new Church year with Advent. Ordinary Time is also known as the Season after Pentecost, because we carry the gift of the Holy Spirit with us throughout this time. 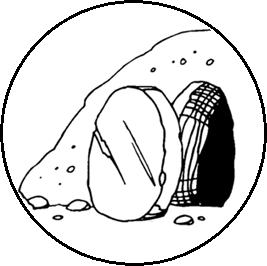 In this season, we move from a focus on the events of the earthly life of Jesus (the focus of most other holidays and seasons) into a focus on how we as his disciples, following the example of his first disciples, will take what we have learned from Christ, in the power of the Holy Spirit, into the world and our everyday lives. On All Saints' Day, the Church honors all the saints, known and unknown. In the broad sense, all we who are baptized are included in this category, but from the beginning of the Christian tradition, certain of the faithful whose lives were exemplary have been held before us as our models and guides. The Commemoration of All Faithful Departed, more commonly known as All Souls’ Day, falls on November 2nd. This day is set aside to remember those who have died to whom we have a more personal connection. Día de los Muertos is the traditional Mexican celebration of these days, which often features altars like the one here at St. Georges, honoring those who have died. These celebrations – All Saints’, All Souls’, and Día de los Muertos – are tied in with the belief in the Communion of Saints, that all of God’s people, in this earthly life and in the various states of the larger life, are connected in one communion. The first Sunday of Advent begins the Church's liturgical year. Advent begins four Sundays before Christmas and lasts until Christmas Eve. It is a time of reflection, waiting and preparation for the birth of Jesus Christ. The season's name is derived from the Latin word adventus, which means "coming." Advent is a time of preparation and expectation for the coming celebration of our Lord's nativity, and for the final coming of Christ in power and glory. The Scripture readings throughout the season reflect this anticipation of the coming of Christ – both as a babe in Bethlehem and at his Second Coming. The Advent Wreath is the most common symbol of Advent – a circle of greenery with four (or sometimes five) candles, each of which represents one of the Sundays of the season. 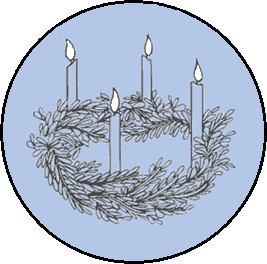 (The fifth, which is placed in the center if used, is called the Christ Candle and is lit on Christmas Eve.) Each Sunday, the circle of light expands, as Christ comes ever closer. Christmas celebrates the Incarnation of the Word of God in the birth of Jesus Christ. Christian tradition celebrates Christmas as a season rather than as a single event. The Christmas season – the Twelve Days of Christmas – brings heightened meaning to days that socially and culturally are often viewed as a let-down. The Christmas season is the fulfillment of Advent and bridges the days to Epiphany. We look for salvation to the one who came among us in the most humble way, a helpless child born in a scandalous way to a poor peasant couple. The Incarnation, God with us, changed the world in ways that we insist are leading to the ultimate healing of all creation.“See, your salvation comes,” says the prophet in every age, yet it is not yet fully come upon us. We live in hope for its fullness. May hope be nourished within us, in each and every human being and community, for the journey toward God’s healed and holy future. Christmas was first celebrated in Rome in the 4th century. It gradually spread to the churches of the east, which already had a festival on January 6 commemorating the manifestation of God in both the birth and baptism of Jesus. The customs associated with Christmas have developed from many sources. From early days the popular observance of Christmas was marked by the joy and celebration characteristic of the Roman Saturnalia and the pagan festivals which it replaced. It came to include the decoration of houses with greenery and the giving of gifts to children and the poor. Fires and lights (symbols of warmth and lasting life) and evergreens (symbols of survival) were traditionally associated with both pagan and Christian festivals. The Word epiphany comes from the Greek word epiphaneia, which means “appearing” or “revealing.” The Epiphany season focuses on God’s self-revelation in Christ. Christian tradition pays special attention to the gradual revelation of Christ's nature as shown in the visit of the Magi, the baptism of Jesus, andthe Wedding at Cana where he performed his first miracle, changing water into wine. With this revelation, the promise of Christmas begins to be fulfilled, as the light of Christ enters the world: "Arise, shine, for your light has come, and the glory of the Lord has risen upon you" (Isaiah 60:1). During the Epiphany season the predominate theme is God making God’s-self known to the world through Jesus, the divine Son. 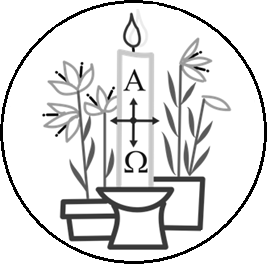 The observance of Ash Wednesday begins with an invitation "the observance of a holy Lent, by self-examination and repentance; by prayer, fasting, and self-denial; and by reading and meditating on God's holy Word." The service also features the imposition of ashes, a reminder of our mortality and dependence on God, and an invitation to reflection and repentance.